I guess I'll just wait until it comes in to photograph the print. Sorry guys. I don't seem to be able to fix the print issue not showing up here. It might be an issue with the quality of the scan I received. I see it. It's the guy with a large bird above his head, correct? I don't believe it has anything to do with the picture itself (being a scan or anything else), because whenever it shows up it's of perfect quality. Where did you host the picture? On imageshack and Ari hosted it right here on the gallery. Yes, Jerome. It is the illustration inside the Desperation book with the buzzard above Johnny. Hmmm, I just may have to own that first one. Heh Heh Heh. I am mystified why an image hosted here doesn't appear. If it is a widespread problem, we should post the issue in the technical problems thread in The Dogan. It happens from time to time to different people. Personally I've been able to view this one from the start with no problem, but I've experienced the issue at other random times. I don't think it is a TDT.com issue. I agree. Perhaps try a different browser just to see. It's quite nice in that you will be able to view all the pieces together, in small, medium or full size to see the details. The link will also be added to the 1st post on this thread for ease of viewing. Last edited by Fsmdr; 10-22-2009 at 09:13 PM. 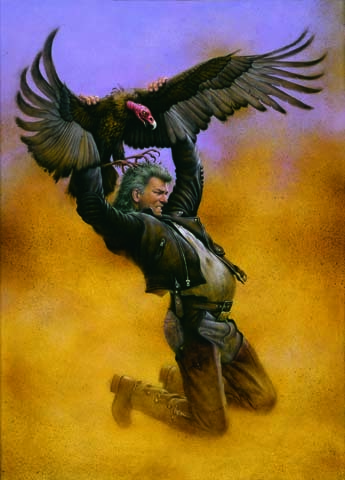 Reason: Added 'Art © Don Maitz' by Don's request to the images. Note: It will not appear in the original art. The link worked for me. I like them! I like the detail of the dirt on the front of the car. More info on the sale of the Desperation remarqued books. They will not be available for purchase until all the remarques are completed. That way everyone has a chance to browse and decide. It is likely that they will be completed within a month or less. Don works fast, in my experience. Selling price is $395 including domestic Priority Mail for all tdt.com member. International shipping, please add $28 to Canada and $35 to Europe. In the meantime, please enjoy the show. How do you determine-if more than one member wants the same item, who is selected? First serve basis maybe? I was going to ask the same thing. Yes, 1st come, 1st served. A date and time will be selected when orders will be accepted. The link works now. Go figure. Yeah, I think these are legit enough to start a few bidding wars...but, having them for sale at one price, first-come, first-served, might also start a semi-frenzy of orders too...good price too. Would you be so kind as to not start the sale at 5 or 6am Pacific time? Perhaps something just a bit later like noon Eastern-let everyone sleep in a bit before the fun begins. That isn't a bad idea Jerome. Having it held at a time appropriate for everyone able to buy them will ensure a larger buying pool. Heck no, definitely not a 6 am start time. I am in CA, so the time is going to be later than earlier. Btw, i just got scans for remarque no 3 and 4. Don is on a roll!. Last edited by Fsmdr; 10-22-2009 at 09:15 PM. Reason: Added 'Art © Don Maitz' by Don's request to the images. Note: It will not appear in the original art.